Rock Revolution lets you release your inner rockstar or allows your friends the privilege of picking up an axe or pounding the skins with you to 41 mind bending rock tracks! Unleash your creative juices in the Studio Mode where you can create your own music in a state of the art multi-track studio! This is the musical revolution the world has been waiting for! The "Bemani Pack" includes "My Only Shining Star", "Death Real", "CHIMERA", "Progressive Baby" and "MODEL DD 8" from the Bemani Music Production team. Expand your Rock Revolution track library by purchasing this track pack. PLEASE NOTE: Many Rock Revolution game tracks are available both as a single song as well as part of a multisong download at a discount. These tracks are exactly the same. Please note that it is possible to download the same track twice. Please consider your purchase carefully. For music credits, visit the Rock Revolution section of www.konami.com. There are no refunds for this item. For more information, see www.xbox.com/live/accounts. "CHIMERA" is a power metal inspired original by Daisuke Kurosawa of the Bemani Music Production team. Expand your Rock Revolution track library by purchasing this track. PLEASE NOTE: Many Rock Revolution game tracks are available both as a single song as well as part of a multisong download at a discounted rate. These tracks are exactly the same. Please note that it is possible to download the same track twice, so please consider your purchase carefully. For music credits, visit the Rock Revolution section of www.konami.com. There are no refunds for this item. For more information, see www.xbox.com/live/accounts. "MODEL DD 8" is an original instrumental metal track from Mutsuhiko Izumi of the Bemani Music Production team that features the guitar work of Marty Friedman. Expand your Rock Revolution track library by purchasing this track. PLEASE NOTE: Many Rock Revolution game tracks are available both as a single song as well as part of a multisong download at a discounted rate. These tracks are exactly the same. Please note that it is possible to download the same track twice, so please consider your purchase carefully. For music credits, visit the Rock Revolution section of www.konami.com. There are no refunds for this item. For more information, see www.xbox.com/live/accounts. "My Only Shining Star" is a rock remake from Kuro of the Bemani dance classic written by NAOKI. Expand your Rock Revolution track library by purchasing this track. PLEASE NOTE: Many Rock Revolution game tracks are available both as a single song as well as part of a multisong download at a discount. These tracks are exactly the same. Please note that it is possible to download the same track twice. Please consider your purchase carefully. For music credits, visit the Rock Revolution section of www.konami.com. There are no refunds for this item. For more information, see www.xbox.com/live/accounts. "Death Real" is a metal original from Des-ROW of the Konami Bemani Music Production team. Expand your Rock Revolution track library by purchasing this track. PLEASE NOTE: Many Rock Revolution game tracks are available both as a single song as well as part of a multisong download at a discount. These tracks are exactly the same. Please note that it is possible to download the same track twice. Please consider your purchase carefully. For music credits, visit the Rock Revolution section of www.konami.com. There are no refunds for this item. For more information, see www.xbox.com/live/accounts. "Progressive Baby" is an original instrumental progressive metal track by Daisuke Kurosawa of the Bemani Music Production team. Expand your Rock Revolution track library by purchasing this track. PLEASE NOTE: Many Rock Revolution game tracks are available both as a single song as well as part of a multisong download at a discount. These tracks are exactly the same. Please note that it is possible to download the same track twice. Please consider your purchase carefully. For music credits, visit the Rock Revolution section of www.konami.com. There are no refunds for this item. For more information, see www.xbox.com/live/accounts. "NO PAIN, NO GAIN" is a FREE original rock track from the Rock Revolution Band within the Bemani Music Production team. Expand your Rock Revolution track library by purchasing this track. PLEASE NOTE: Many Rock Revolution game tracks are available both as a single song as well as part of a multisong download at a discount. These tracks are exactly the same. Please note that it is possible to download the same track twice. Please consider your purchase carefully. For music credits, visit the Rock Revolution section of www.konami.com. "She's the Bug" is a FREE original funk rock track from the Rock Revolution Band within the Bemani Music Production team. Expand your Rock Revolution track library by purchasing this track. PLEASE NOTE: Many Rock Revolution game tracks are available both as a single song as well as part of a multisong download. These tracks are exactly the same. Please note that it is possible to download the same track twice. Please consider your purchase carefully. 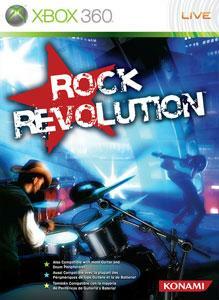 For music credits, visit the Rock Revolution section of www.konami.com.